The technical experimentation of the film feels contradictory, because at the same time that it presents visual marvels and immersive color unlike any I have seen before, the narrative is overly simplistic. The point of the film can be surmised halfway through the narrative, at which point the remainder just feels like overindulgent sentimentality. The performances are strong, but it just never feels like the film has enough material to earn the emotional impact that it attempts to create. The narrative focuses on Billy Lynn (Joe Alwyn), a 19-year-old private whose heroism in battle was captured on film and leaked on the internet for all to see. This moment catapults Billy and his squad into the spotlight, so they are shipped back to the states to tour as heroes in order to promote the heavily criticized Iraq War. 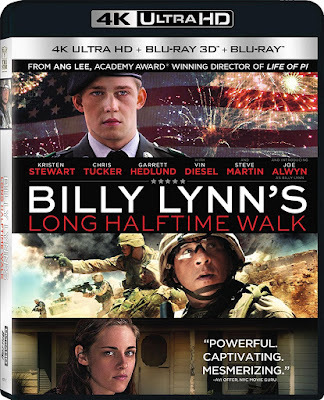 Billy Lynn’s Long Halftime Walk is based on a novel by Ben Fountain, and while it is entirely fictional, it simultaneously serves as a satire of American reception of real events. The film’s strength lies in the examination of the relationships that bond soldiers together, regardless of their beliefs about the war. The film includes many flashbacks, but only actually takes place over the course of one Thanksgiving Day on the tail end of the Bravo’s tour. Their last appearance is to take place during the halftime show of a Dallas Cowboys game, though they are merely background for a performance by Destiny’s Child. Their other reason for being at the game is to try and make a deal selling their story to be made into a feature film, with the help of producer Albert Brown (Chris Tucker), who is attempting to sell the idea to the owner of the Cowboys (Steve Martin). At the same time, Billy is struggling with the decision to return to war during the game, flashing back to conversations with his objecting sister (Kristen Stewart) between bouts of PTSD. Billy Lynn may be the title character and protagonist we spend the most time with, but the central figure of the narrative is the entire Bravo Squad he belongs to and the relationship they have with each other. In order to adequately convey the unity of these individuals, it is important to show that each of the soldiers have distinct and unique personality traits. The only problem is that the film also wants to go into greater detail about Billy Lynn’s background, provide flashbacks of a significant firefight in Iraq, and offer visual parallels in the spectacle of a pop culture-driven halftime show during a football game on Thanksgiving. With all that it is trying to accomplish within the concise running-time, many of the supporting characters end up coming off as clichés rather than fully developed characters. Even if this may not have been the best vehicle for the technical experimentation, it is worth mentioning that even in 60 fps, Billy Lynn boasts an impressive visual presentation. The clarity of the images is certainly impressive, but it was the depth and range of colors that truly shocked me. It may have been used to show the superficiality of the Beyoncé-led halftime show, but I couldn’t help but be swept up by the spectacle. This may simultaneously prove that the medium was the wrong choice for this film, or maybe that incongruity is precisely the point of director Ang Lee’s decision. Either way, this may be one of the first films where 4K Ultra HD truly is a necessity to experience it the way that was intended. Although the 4K discs typically don’t include the special features, there is a featurette on this disc highlighting the groundbreaking technical advances. This would not have had the same impact on the standard Blu-ray, where the remaining extras are contained. There are a handful of deleted scenes and four additional featurettes. There are technical featurettes such as “Into Battle and Onto the Field: Stepping Inside Billy Lynn’s Long Halftime Walk” and “Recreating the Halftime Show,” as well as a featurette about casting and one about the camaraderie of soldiers. Along with a standard edition Blu-ray, there is also a 3D Blu-ray included, for those more interested in the extra dimension than the extra frames per second.